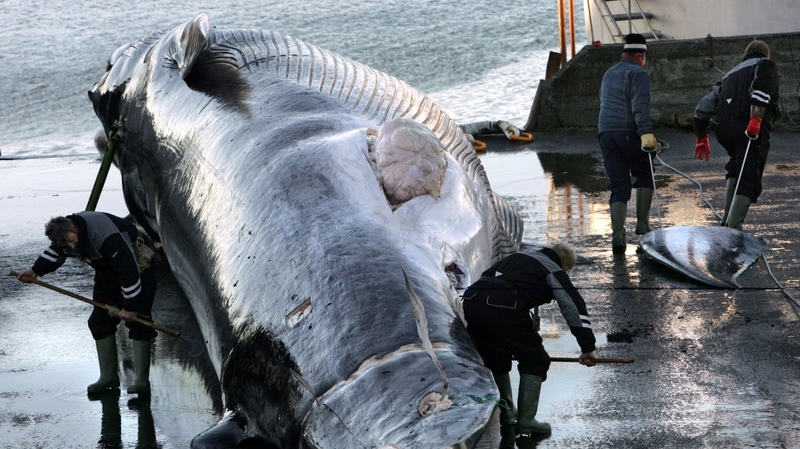 Norway and Iceland – the only countries to explicitly allow commercial whaling – were among those who backed Japan’s bid. Tokyo said it would undertake a “fundamental reassessment” of its IWC membership following the vote, which guaranteed the body’s 1986 moratorium on commercial whaling will continue. Patrick Ramage, a director of marine conservation for the International Fund for Animal Welfare (IFAW), welcomed the result as “good news for whales”, adding that Japan’s “audacious proposal would have been a big step backward”. “It [the proposal] could have erased a generation of conservation measures and restrictions on whale hunting,” Ramage told Al Jazeera from the summit in Florianopolis, the capital of Brazil’s southeastern Santa Catarina state. “It’s increasingly clear that Japan needs to reconcile itself to the emerging global consensus for whale conservation instead of whale killing,” he added. On Thursday, the IWC also passed a non-binding “Florianopolis Declaration” stating commercial whaling is no longer a necessary economic activity by 40 votes to 27. Japan’s call for the IWC’s moratorium to be lifted formed part of a proposal for wider reform of the organisation, which it suggested should focus on “resource management” and permit species of whales “whose population is healthy enough to be harvested sustainably”. In particular, Tokyo was keen to win a concession allowing for the regulated hunting of Minke whales, a species it has claimed are abundant and in no danger of extinction. Minke whales, comprising of the Common and Antarctic varieties, are not listed as endangered by the International Union for Conservation of Nature. “Minke whaling is an integral part not only of our history, but also of our own lives,” the Japanese delegation said in its opening statement to the summit. “We are proud that Japan’s small-type coastal minke whaling has always been a sustainable fishery. Our fishery has not negatively impacted the ecosystem and it never will,” the statement added. Whale meat is a popular foodstuff among certain parts of Japan’s population, though demand for it has fallen significantly in recent decades, according to a 2013 IFAW report. Japan, the current chair of the IWC, officially observes the body’s prohibition on commercial hunting but continues to capture hundreds of Minke whales each year under an exception to the ban, which permits the killing of whales for scientific purposes. In 2014, the International Court of Justice (ICJ) ordered Japan to halt its whaling programme in the Southern Ocean, also called the Antarctic Ocean, after determining that the hunting permits granted by authorities were not being used “for purposes of scientific research”. Under the terms of the 1986 moratorium, certain aboriginal communities are also allowed to catch and kill a regulated number of whales, in line with their historic cultural practices and the mammals’ nutritional value. In 2016, aboriginal catches amounted to 361 – comprised of Fin, Humpback, Minke, Gray and Bowhead whales. The hunting took place in Russia, Denmark and the United States. An estimated 45,000 whales have been killed since the IWC’s 1986 ruling, according to the UK-based Whale and Dolphin Conservation Society, including those hunted under its exemptions (scientific purposes and aboriginal catching). Claire Bass, director of the US-based animal protection organisation Humane Society International, said overturning the moratorium would have risked “robbing future generations of the opportunity to meet, admire and learn from the ocean’s giants”. “Japan’s proposal to resume commercial whaling would be like jumping from a plane without a parachute,” Bass told Al Jazeera. “Whales are long-lived, slow-breeding animals and this makes them especially vulnerable to over-hunting,” she added. Six of the world’s 13 “great whale species” are classified as endangered, according to the World Wildlife Fund (WWF).